While we still lack definite confirmation that the title of the Jonas Brothers’ next album will be Lines, Vines And Trying Times, we can tell you (fairly) confidently about where the Jonas Brothers are coming from on their new album. 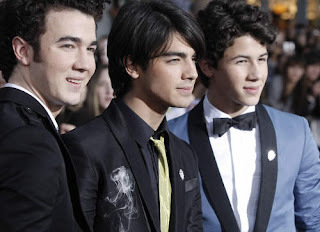 In a recent Billboard interview, Nick Jonas revealed that the boys drew heavy inspiration from Elvis Costello, The Zutons, Kings Of Leon and the reigning king of all entertainment, Neil Diamond. And while we can’t tell you exactly what that sounds like through a Jonas filter, we can tell you a little bit about those bands. Consider it a Lines, Vines, And Trying Times primer for the uninitiated. NEIL DIAMOND: Need I say more? If you don’t know Neil Diamond, you’re still just waiting to be born. Here’s a classic. Play it loud, my baby.